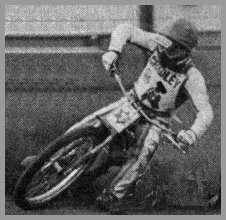 Aussie Dave Cheshire came to Dudley Wood in 1983. He was signed by Peter Adams before the start of the season but then missed the first few weeks with a fractured collarbone. He finally made his debut at Sheffield on 28th April, scoring one point from two rides. His Dudley Wood debut was two days later in the return leg, however he only rode in another couple of matches before beign dropped from the 1-7 and offered a National League berth to gain experience. 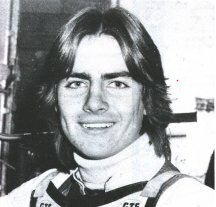 Peter Ravn was brought in as a replacement who went on to make the team place his own for the rest of the season as the Heathens romped to their most successful league and cup double. Cheshire went on to double up for Arena Essex in the National League and Wolves in the British League during 1984, and stayed with Arena through until the end of '85. It then came as quite a surprise to Hammers fans to see him move to Birmingham the following year. Despite starting the '86 season as captain of the Brummie's team, Dave quit halfway through the season and returned to Australia. He was tempted back to British racing by a full transfer to Middlesborough in 1990, but retired in 1991.